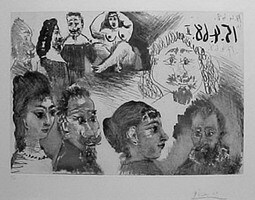 During seven months Picasso led the historic battle against the vogue of conceptual and theoretical “art”, which became popular in the late 1960s. He rejected the conceptualist slogan consisting in that “everyone can be an artist, and everything can be art”. He fought not by words but by deeds, pointing the way back to the aesthetic ideals and technical excellence. 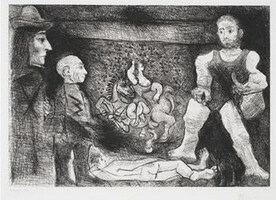 In the ninth decade of his life from March 16 to October 5, 1968, Picasso created a remarkable series of 347 etchings, known as the Series 347. 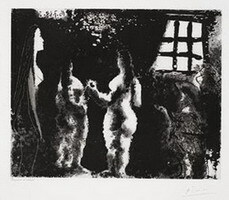 The technical aspect of printing was carried out in collaboration with Pierre and Aldo Crommelynck, who transported special equipment from their Paris studio to the Picasso’s studio in Cannes in 1963. The relationship between the artist and the printers, who knew just how demanding the master was towards the process of work, incarnated in a series of works unusually strong for a 90-year-old artist. By combining different cultures, periods and signs, Picasso created a unifying theme, to which he was not a participant but an observer and a storyteller. 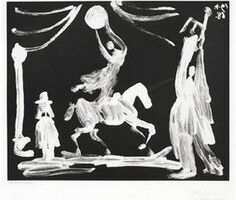 Circus artists, musketeers, musicians, artists and their models painted in a special light graphics of late Picasso appeared in complex combinations of various techniques: etching, engraving, drypoint, and aquatint. Full of outright eroticism, this series has often been criticized, including in Russia. 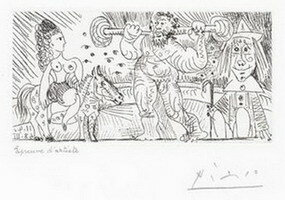 “As I draw, I watch my characters hour after hour and think about many crazy things; this is my method of writing fiction”, - Picasso commented on the series. Brigitte Baer, who wrote several books about the artist, mentioned that this series was one of the rare moments in Picasso’s career he “peered not into own his inwardness, but rather into its own perception of the outside world”.